Frank Hoffer is senior researcher at the Bureau for Workers' Activities of the ILO. 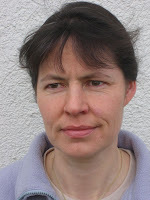 Friederike Spiecker is a macroeconomist and independent consultant. She has published widely together with Heiner Flassbeck, chief economist at UNCTAD, on German, European and international economic policy. The first scenario, which the authors call "deflationary cost cutting", is undesirable and possibly not feasible in all the eurozone countries presently in crisis. I believe that the scenario is called "internal devaluation" by the EU and "toughing it out" by Paul Krugman, a US economist. On the other hand, the authors' call for "co-ordinated or centralised collective bargaining and universal application through legal extension mechanisms" will be difficult to achieve in practice. 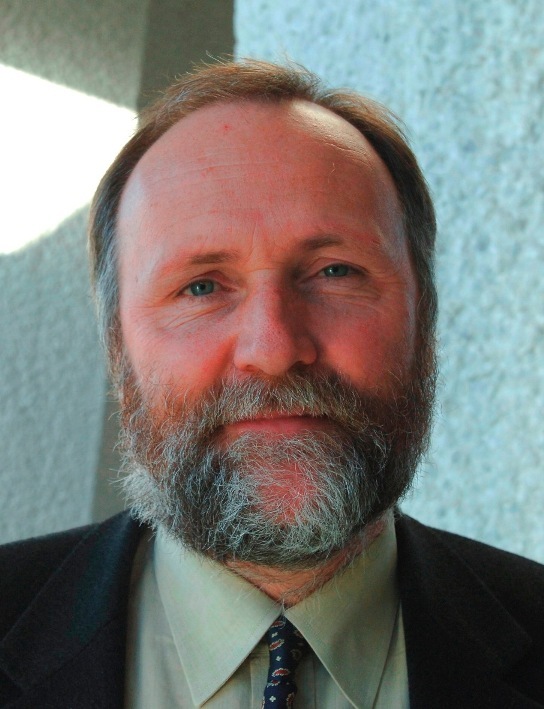 Co-ordinated bargaining is in some countries controversial even among trade unions, and there are legal obstacles to extending collective agreements. A further problem is the single monetary policy for countries in very different economic situations. The ECB's policy is likely to be adjusted to the largest economies, especially Germany. In the past, that has been too expansionary for some of the periphery countries, resulting in property booms and/or unsustainable wage increases. If the ECB begins to raise rates soon, it will be too restrictive for those countries. I suspect that successful integration would have to rely more on scenario 2 than the authors propose; i.e. constant public transfers. Those would be social transfers and infrastructure spending. I agree that the politics are difficult. A positive point: Table 2 suggests that since 2007, the German unit labour cost trend has converged with those in France and Southern Europe. So the Eurozone's prospects could improve over the longer term, if policy makers can somehow muddle through with elements of all three scenarios. The increase in unit labour costs in Germany following 2007 is due to the massive capacity underutilization when Germany’s export industry was hit by the crisis. As the table shows with the recovery of the export industry in 2009 unit labour costs are falling again. So little hope that German wage growth and convergence are already under way. Yes, in some countries some trade unions do not support coordinated wage policies. This is particular the case for small unions with strong bargaining positions, who put their narrow interests above a broader concept of solidarity. Doctors, Pilots, air traffic controllers, locomotive drivers etc. are the usual suspects. However, if trade unions reject coordinated bargaining the competitive pressure will further increase. Yes some specialized minority groups might do better in such a situation, but is that what the labour movement wants and needs? I have noted a change in the discussion of the job market by the German mainstream media, television to be more precise. Over the past few months the emphasis has shifted from unemployment (job shortages) to labour shortages, especially of skilled workers. That could mean that the balance of power is moving from employers to workers. Over the past decade or so, employers have had an advantage, due to the effects of German reunification, socio-economic reforms and globalisation. However, if labour shortages continue to mount, they could translate into faster German wage growth. Perhaps I'm being too optimistic.
" In 2009, hourly labour costs in the German private sector were 29 Euros. This puts Germany in seventh place, and hence it remains in the middle of the EU states. 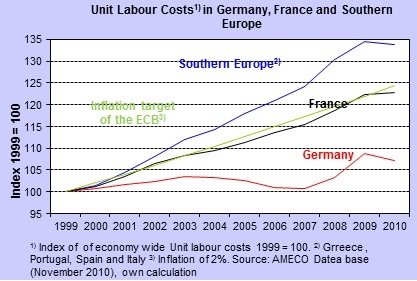 While labour costs in Germany increased by only 2.3 percent, they increased by 2.9 percent on average for the euro zone. This means that, once again, labour costs in Germany rose at a below average rate. The higher short-term increase in German labour costs in the early phase of the economic crisis was caused by shorter working hours and short-time work. However, labour costs have, by the third quarter of 2010, gradually declined and have almost returned to the initial low trend increase. Unit labour costs developed in a similar fashion. After an initial short-term increase in the unit labour costs - statistically also shown as a productivity slump - they adjusted again to the below average trend in comparison to the euro area." Well, we'll see what happens, Frank. I wish to return to and more clearly support the authors' demand for an extension of collective agreements to all workers in their scope. This is also an essential measure to fight pay discrimination against foreign workers, including posted workers, as has been shown with some success in Norway and Switzerland. The relevant ILO instrument (Recommendation 91) provides for and sets down some rules for the extension of collective agreements. A point worth noting at a time when economic policy-makers are pushing in the opposite direction. 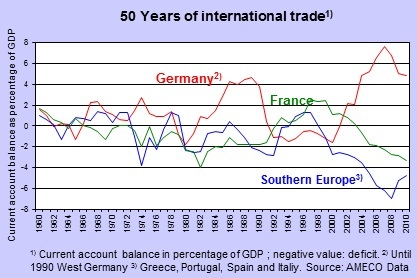 The Trade after 1990 goes down in GDP % but as far as i know Germany had even in this time on yearly basis no trade deficit. this was the German reunification and a high domestic demand. but on yearly basis there is no trade deficit. never. Ofcourse in %GPD it will be after reunification probably smaller because Germany's GDP will be bigger just because 17Million more people. but those mostly dont export nearly as much as the West. or I'm wrong with this? How was Germany's ULC to expensive, or how was Germany not competitive with 120billion DM (buying Power like back then in the south of 120billion €). its very good to see that the unemployment that just came down after the integration of East Germany was completed. it goes with the euro up to a new all time record high. In this time was also the EU East expansion, at the all time high Agenda2010 is created.